The Romsey range is perfect for family homes. It features friendly details and it's crafted from solid natural oak for a beautiful sunny finish. Our Romsey range is a delightful addition to the modern family home. 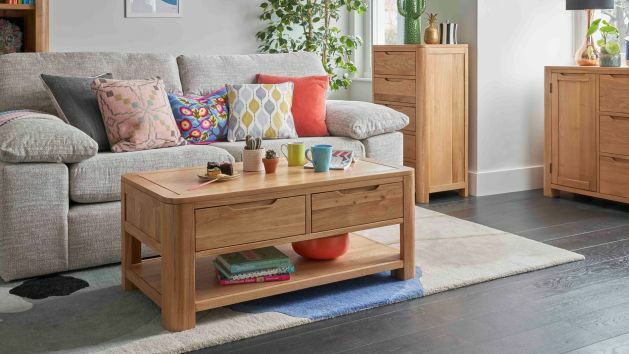 Made from high quality natural solid oak, it will look great for years to come, and is packed with durable design details like rounded corners and flat-fronted drawers with recessed handles. The recessed sculpted handles are easy to open, and the drawers are made with real dovetail joints and solid hardwood bases, backs, and runners for a finish that will stand up to everyday life. Romsey is characterised by its cheerful rounded edges, and sunny natural oak finish, that will add a comfortable feeling to any room in your home. With a great selection of pieces available, you're sure to find something you love in our Romsey furniture range.